The Rev. 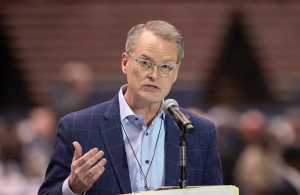 Adam Hamilton, senior pastor of Church of the Resurrection in Leawood, Kansas, speaks at the special General Conference in St. Louis. Photo by Paul Jeffrey, UMNS. 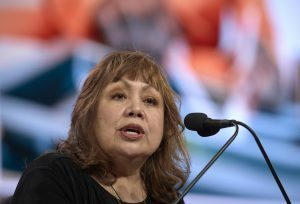 –Great Plains Conference Bishop Ruben Saenz Jr.
Bishop Minerva Carcaño speaks during the opening session of the Special Session of the General Conference of The United Methodist Church. Photo by Paul Jeffrey for United Methodist News Service. If the Traditional Plan is constitutional, at least the parts pertaining to the ban on the ordination of avowed or practicing homosexuals, when will those in disobedience be brought to trial and dismissed from the Church? For one I am withholding my contributions to the the United Methodist Church. Why should those of us who are Traditionalist continue to support with our funds a hierarchy that fails to honor our (the majority) wishes and established Church law? I for one am giving to the WCA. Mr. Wiggins, I totally agree and am doing likewise. I cannot worship God when I’m angry, and when my pastor says we have to ordain and marry practicing homosexuals, I become angry at the misuse of Scripture. Therefore, I’m finding another place to worship on Sunday morning, tho’ I still love and attend my SS Class. Further, why would we support the thirteen theological seminaries with our apportionment money if they reject the traditional plan, while allowing Hiawassee to close it’s doors due to financial problems? Question: Is the theological training that our pastors receive at UMC seminaries the root of the problem? The US representation at GC2019 versus the recent poll of theological leanings of people in UMC pews makes me wonder. Using Bishop Carcano’s definition, I am a homophobe, even though I, myself, am on the LGBTQ+ spectrum (NOT ex-gay). Bishop Carcano needs to wake up and realize that there are many gay Christians living a life consistent with traditional sexual ethics. Thank you for speaking out. The culture leaders don’t want to hear your voice, but it needs to be heard. “It is excluding those whom Christ fully includes.” Strong words, and bold, speaking on behalf of Christ. And how do we know Christ “fully includes” these persons (without getting into what exactly is meant by “includes” in this context)? From Scripture? From direct personal revelation of the Holy Spirit? Or is this Hamiltonian “we just know” what Scripture says on these issues is not God’s will? Telling traditionalists they are “setting Christ aside” (!) radically escalates the stakes in this disagreement. Oh wait the One Church Plan was about unity with diversity… except… now I’m confused. The calling of Christians is to present the Gospel and the hearer either chooses to follow it or not. It is is not our calling to redact the Gospel until it is palitable to the hearers. Rank-and-file United Methodists are tired of these issues, issues our leaders have failed to resolve amicably. Churches aren’t particularly good at the unity Paul advocated. 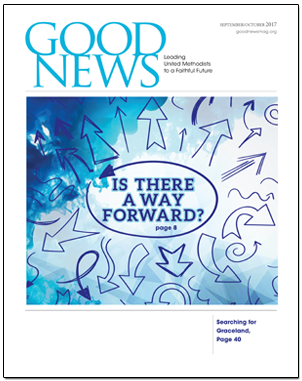 It is becoming clearer that the day may well have arrived for a split in Methodism – call it between traditionalists and progressives, if you wish to. Perhaps smart heads can yet figure out how to keep both connected under one worldwide Wesleyan umbrella organization. At least the General Conference passed the only plan that was biblical. And for all the bishops and pastors that don’t follow that plan should be fired. It’s sad but the church today is more focused on number of embers and money more than it is on Jesus. God answered prayers in St Louis. His will be done. Not my will, not Adam’s will, but God’s will be done with His church. God’s word is clear. No vote will change it. God’s people will follow God’s Word not Adam’s word. It’s interesting that Africa with 5.6 million United Methodists is ignored in all these discussions. That US CENTRISM has led the UMC to this Theological mess.